Telkwa Part of the BC Adventure Network. Over a million web site visitors annually ! You can salmon fish the river from Main Street in Telkwa, a forestry and agriculture village on the TransCanada Yellowhead (hwy 16). While many not want to fish in this manner, the entire area can provide great steelhead, salmon and trout fishing. The town's name is Wet'sewet'en for "where the waters meet", Telkwa being at the junction of the Telkwa and Bulkley Rivers. There are many heritage buildings in the town to take you back to the turn of the century, when the area first became settled for agriculture and later became the economic centre of the valley. Today the area is also known for its many possibilities for the outdoor enthusiast. 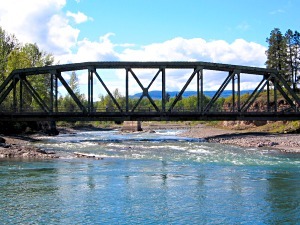 Hiking, wildlife viewing, fishing and heli-skiing throughout the Bulkley Valley, fossil hunting at Driftwood Canyon Provincial Park or camping, picnicking and boating at nearby Tyhee Lke Provincial Park are just some of the activities to be experienced in the area. Access: Telkwa lies on the major highway 16. Although the area is service by the Smither's Airport, Greyhound Bus Lines makes a stop at the community. There is a seaplane base nearby. Recreation Facilities & Activities: tennis courts, soccer/baseball fields, horseshoe pits, skating rink, walking tours, fishing, boating, rafting, kayaking, canoeing, tubing, hiking, skiing, swimming. The recreation facilities of Smithers are very close. 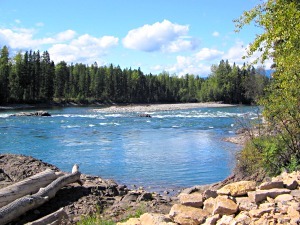 Accommodations: There are two provincial campsites plus a couple of private campsites and a motel in or close to town. 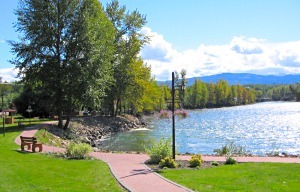 More facilities and accommodations are available in nearby Smithers. Lodges and resorts are located throughout the area.